wooly wednesday: sheep on the go! I have been cleaning/re-organizing my ‘new’ work space for weeks now! I needed to C R E A T E something with a piece of scrap canvas that I had purchased (quite a while ago) at a tag sale for a whopping $3. 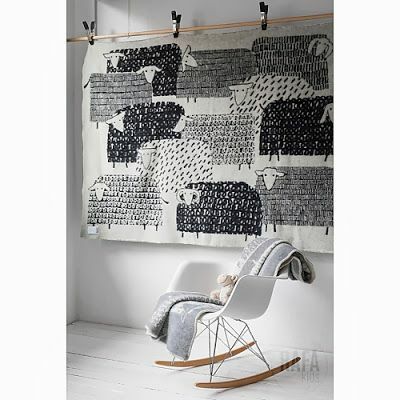 THIS wooly sheep blanket provided inspiration for my canvas wall art. My husband made a DIY frame from scrap lumber to which we stapled the canvas. I applied several coats of Gesso/primer. 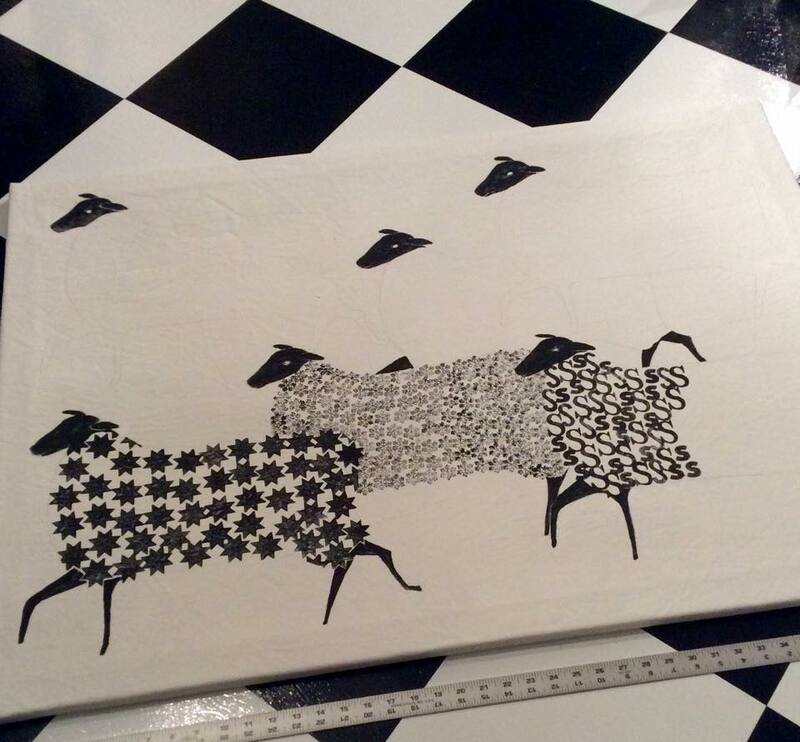 I then re-created (sketched) multiples of my ‘logo’ sheep onto the canvas. Because I wanted to create a ewe-nique texture (and reproducible pattern) for each individual sheep, I used an assortment of plain old rubber stamps that I had in my collection. 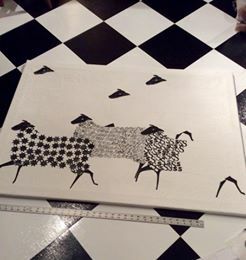 I used black acrylic paint for the head and legs and hand-applied/inked the stamp (also with acrylic paint) and worked within the outline of my sheep to create a ‘wooly fleece’. Each sheep’s fleece is ewe-nique… can you see?? The finished canvas measures about 43-inches by 31-inches and will grace my wall in my work space… as soon as I attach some hanging hardware [wink]. 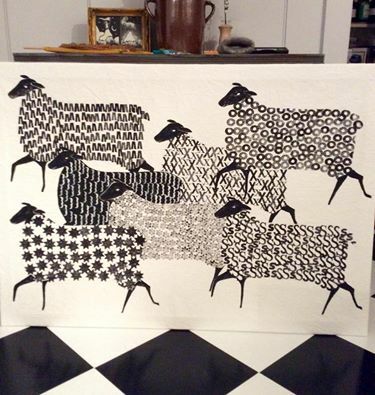 TA DA… my “Sheep on the Go” wall art masterpiece. I even added a black sheep. Every family/flock has one…??! This entry was posted in Farm, Projects, Sheep/Fiber and tagged Farm, farm fresh, featured artisan, featured artist, folk art, Sheep/Fiber, sheepy, Shetland sheep, Shetlands, whimsy by Sheepy Hollow Farm. Bookmark the permalink. Well now, ‘the crazy sheep lady’ doesn’t surprise me!!! It really was simple and F U N to create!! I never get tired of creating sheepies!! That is great! Love your blog. Love it! No surprise there…you’re always so creative and spot on! HAHAHA!! You ladies are as ‘sheep-silly’ as I am, but, who cares!! Never enough sheep, right!!? This is adorable. You are so creative and ewe-nique yourself. Oh I love your wall art! Great work! Your new work space is going to be wonderful! Thank you! Never enough sheep… heehee.